San Angelo, Texas — The second weekend of February proved to be a very busy one for rodeo cowboys and cowgirls chasing down the lucrative Stock Show run in pro rodeo. With the conclusion of the Fort Worth Stock Show and Rodeo’s 29 performance run, the beginning of the San Antonio Stock Show and Rodeo as well as the middle weekend for the San Angelo Stock Show and Rodeo, rodeo athletes have plenty to juggle as they compete for hundreds of thousands of dollars in prize money and sprint around Texas. It’s been 20 days since the journey to the San Angelo championship began for the ladies of the WPRA. Two hundred twenty-three cowgirls signed up to compete, beginning with a long round held back on January 25, 2019 in the Spur Arena, right next door to San Angelo’s Coliseum. With about half cut off for the second round, 120 ladies continued to compete during the performances as competition switched venues, moving to the now sixty year old Coliseum. Following the opening weekend of rodeo perfs on February 1-3, Mississippi cowgirl Nicole Love led the field on the two-run average, which will determine who competes in the Championship Round on Friday night, February 15. Love’s lightning quick 14.08 in round two held strong throughout the second weekend of rodeo in West Texas but it did get pushed during an exciting Sunday matinee. The rodeo got back into action on Friday night, February 8, in a performance led by WPRA World Champion cowgirl Kappy Allen. Allen won the title back in 2000 on the wings of her first of two consecutive Wrangler National Finals Rodeo average wins aboard the great gelding Risky Chris. In San Angelo, she stopped the clock at 14.34 seconds to top the night. Also moving into the average (Allen went to a share of fifth), former Wrangler NFR cowgirl Cheyenne Wimberley posted a run of 14.44 seconds to move to a share of third at the time. Wimberley rode her horse Lex in San Angelo and has had a good winter already, sitting 10th in the WPRA World standings. The leaderboard got quiet during two performances on Saturday with Judi Reed topping the matinee with a time of 14.53 and Lisa Thornton taking the victory lap in the evening with her run of 14.51 seconds. Then came Sunday. Several cowgirls put their names into contention for a short round berth including Carolynn Uhler, who ran a 14.41 aboard Tobi, along with Ilyssa Glass, Jennifer Driver and Ryann Pedone. Pedone won fourth in the opening round aboard Dash Ta Jones and switched to the veteran Wrangler NFR horse Slick by Design for the performance round. But it was the final two cowgirls to compete who made the biggest splash. Both Alex Lang and Dona Kay Rule were originally scheduled to compete on Saturday night. Since both ladies qualified to the finals in Fort Worth at the same time, they were moved to Sunday afternoon per WPRA rules and given the chance to compete from the bottom of the ground. Both cowgirls took full advantage of the opportunity. Lang put a little scare into Love’s lead with a blistering time of 14.19 seconds, second best of the rodeo thus far. 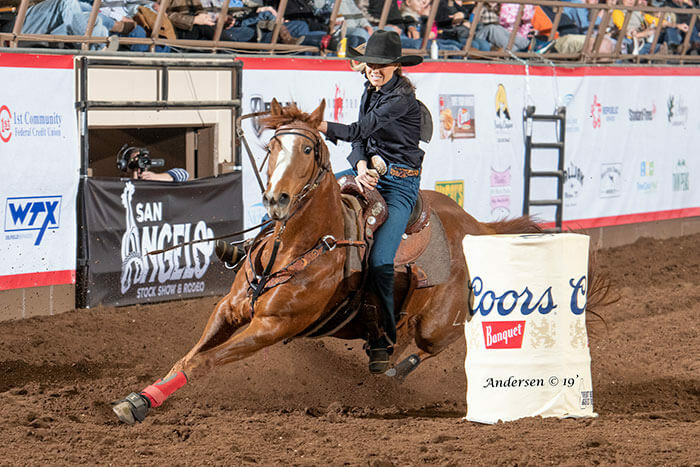 The Harper, Texas cowgirl went into the Fort Worth finals in the 12th and final spot, moving up to ninth in the end, and now has a great shot to make back-to-back short rounds as she is sitting second in the average in San Angelo. For Rule, the Sunday run was a mini-comeback after an oops moment in the finals at Fort Worth left her with a broken pattern on her gelding Valor. The team rebounded well, posting a 14.38 on Sunday to move into eighth in the average. The San Angelo Stock Show and Rodeo takes another break to start the week before its big finish this week. The final two performances prior to the finals will happen on Wednesday and Thursday nights; the bulk of the money winners from the opening go round such as first go winner Wenda Johnson along with Jill Tanner and Sidney Forrest, who finished second and third in the opening round, will compete on Thursday night. With so many of the top times from round one still to compete—and so much at stake including a share of the huge $20,000 committee purse as well as the automatic bye into RodeoHouston given to the champion, the leaderboard is likely to experience some major shuffling before the top 12 in the average on two runs are established for advancement to the final round on Friday night, February 15. For more information on the San Angelo Stock Show & Rodeo, visit them on-line at www.sanangelorodeo.com. Stay tuned to www.wpra.com for continuing updates from the 2019 edition.